transmission rebuilds & repairs for all makes and models. Andy’s looks forward to serving our customers. Check out our blog with news, information and sales. Very professional and quick. They do a great job, I highly recommend. I needed a little clip off of a transmission hose I searched everywhere around my area which is Prince Albert and Saskatoon and surrounding areas no one could help me my brother in law and sister went to Andy’s transmission and they found the part that we needed and gave us an excellent deal… Thanks! I would highly recommend this place. Fast and reliable service and unbeatable prices! Very friendly and quick service for a really affordable and reasonable price! I’m gonna come back! highly recommend to everyone! I called to get a quote on a new transmission. Larry said he would call me back shortly!! He called back within 10 minutes with a fair price and all the details I needed to make a decision. When I went to drop my vehicle off Larry was courteous and quick to take all the info and get to work on our van. Service like this is not something you see every day. Thank you! Great people! Excellent service! Best place if your having transmission or any other auto repairs! The only place to go for your transmission needs. 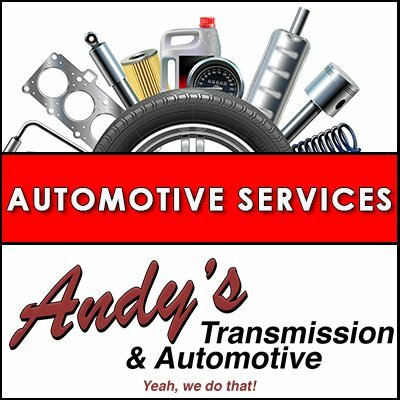 I have been taking my vehicles to Andy’s for 10 years. They are always honest, thorough, and never do any unnecessary repairs. I really appreciate Larry and the guys! Transmissions Repair Services including: Transmission Replacements, Transmission maintenance, & Rebuilt Transmissions. Automotive Services‎: We will inspect and repair any problem with your vehicle. We also handle fleet vehicle maintenance and repair for local businesses. Our auto repair and maintenance includes all automotive systems: fuel supply, transmission, brake, engine, suspension, steering, cooling, exhaust and electrical. Preventative Maintenance:‎ Bring in your vehicle for a regular maintenance inspection: oil changes, multi-point vehicle inspection, tire rotation, tire balancing, wheel alignments and more. Repair Services‎: Brake Services, Engine Diagnosis and Evaluation Services, Axle / CV Joint Repair (FWD), Radiator Repair/Replacement, Automatic Transmission Repair, Manual Transmission Repair, Clutch Repair Service, Four Wheel Drive Systems, Tires New/Replace/Repair, Steering & Suspension Repair, Struts & Shock Replacement.